“If you can sit, you can fly!” That’s what the terrific crew at Just Chute Me! parasailing in Destin, Florida will tell you. That’s all you have to do, just sit and let them do the rest. Parasailing is not what it used to be. You no longer have to take off from the beach or water to go parasailing in Destin, FL. At Just Chute Me! you will take off and land right on the boat. First they will fit you with a parasail harness and seat you on the deck at a place next to your parasailing partner. Then you sit and wait as you are gently launched and retrieved with a hydraulic winch system. It’s that easy! Depending on weight and wind conditions, guests will parasail in groups of two or three. So those that get a little nervous can ride with a friend right beside them to help with those jitters. You even get to decide if you get wet or not. Just let the captain know and he can see to it. No previous experience in parasailing is required and kids as young as six years old can share in this unique experience. The combined weight of those parasailing together must be at least 90 pounds, but no more than 450 pounds. The captains and crew at Just Chute Me! will quickly let you know that parasailing is not a scary experience, but rather is serene and peaceful. With their slow and gentle take-off and landing, they offer the feeling of floating in the air. Early mornings are by far the best time to go when the temperatures are mild and the winds and water are calmer. Just Chute Me! 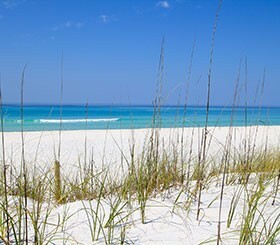 in Destin, Florida is open for business from March to October with the hours of 8 am until sunset daily. Reservations are required, so be sure to call at least 2-3 days ahead of time during the peak season of June through August. If you’re planning on coming with a large group, give them a little more notice of no less than 4-5 days. The parasail boat holds up to twelve passengers, so if there’s room for those who choose not to parasail but just want to go along for the ride, the crew is glad to have you. While the fee for parasailing is $65 per person, the price to ride along is $25. From start to finish, the boating experience takes a little over an hour. Once in the boat, you’ll travel through the Destin Harbor and then through the Destin Pass into the Gulf of Mexico. If the seas are too bumpy there, the captain will take you to the Choctawhatchee Bay for its calmer waters. When you arrive at that destination, the parasailing fun will begin! With the 800 foot towline, parasailers will rise to a height of about 500 vertical feet to enjoy the peace and tranquility of soaring above the earth while enjoying an outstanding view. With more than 17 years of expertise and over 100,000 flights, Just Chute Me! definitely has the experience and know-how to make your parasailing adventure a terrific experience. The captains are U.S. Coast Guard licensed Masters. Captains and crew members are thoroughly trained in all areas of parasailing, boat handling and flight procedures. In addition, they are members of PAPO (Professional Association of Parasail Operators). Safety of their customers is their first priority. Parasailing is all they do and they pride themselves at being the best.